Whether you are a new homeowner or ready to improve your outdoor space, adding some plants and landscaping can drastically improve your yard. Not sure where to start? We’ve got you covered. 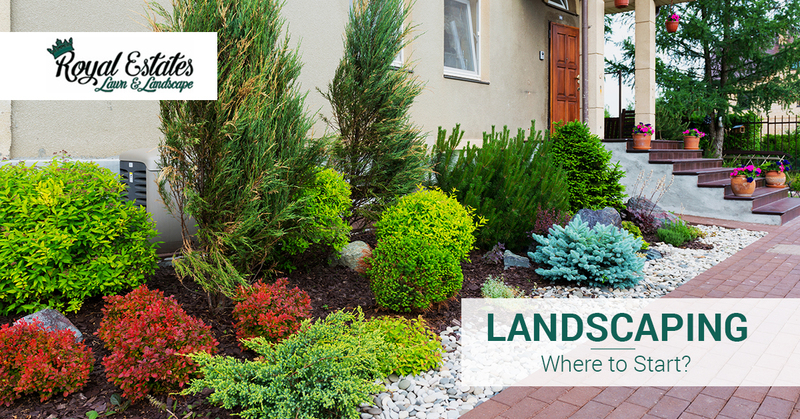 In today’s blog post, Royal Estates Lawn & Landscape would like to share with you some tried-and-true tips for installing a low-maintenance landscape that can spruce up nearly any Louisiana yard. If you are in the Ascension Parish area and are looking for superb, yet affordable, lawn mowing, landscaping, pruning, or mulching services, contact us today! Learn more about us, our outdoor services, and get your free quote here. There are few things as important to the growth and development of your plants as sunlight. For this reason, it is important to spend some time observing how much sunlight different parts of your lawn get at different parts of the day. Pay particularly close attention to shadows and how you can work around or embrace them. Having a good understanding of this can help determine your plant selection and placement. Similar to the sunlight, the gardening zone that you are a part of will be a crucial part of your landscaping choices. While some plants may require a winter dormancy period to survive, others may not be able to tolerate cold temperatures. Keep this in mind and remember that everything from temperature to water levels will affect your new plants. Although this is not absolutely necessary, getting your soil tested can set your new plants and landscape up for success. A chemical test can determine the pH and nutrient level of your soil. Sharing this information with your local lawn care professionals or the experts at your local greenhouse can help ensure you get the most suitable plants. Another thing to consider is the type of soil you have around your home. Is it rocky? Sandy? This information can help determine water-retention rates and help you better plan a low-maintenance landscape strategy. Plants grow. If you are unfamiliar with the type of plants you are planting, you are also probably unfamiliar with how they will grow. This means that the little trees you plant beside the garage could actually grow to become massive, blossoming trees that cover the pathway and brush up against your garage. Before picking out and purchasing plants, be sure to map out your outdoor area, noting the position of fences, pathways, buildings, walls, and other structures. Similarly, it is also helpful to note significant slopes and dips and other existing plants. There’s nothing worse than falling in love with new plants only to find out that their full, mature size is incompatible with your outdoor space. This is like getting a puppy and then having to give it away after two years. To prevent this, think long-term. Consider the total mature height and width of new plants, and how they will fit without requiring excessive pruning and removals. Plants often change in color, shape, and appearance at different points in the year. Try to choose plants that don’t just offer bright and stunning colors and unique structures for just one month out of the year. Instead, opt for plants that provide year-long performance. Part of the reason for doing your homework and planning is so that you don’t end up investing in plants that are incompatible with your home. For example, adding tropical plants that require superb drainage and sandy soil to a lawn that is primarily thick clay. Factor in the nutrition and condition of your lawn. After all, the goal is to maximize the amount of time you can enjoy their beauty, not the amount of time you spend keeping them alive and caring for them. As a general rule, choosing plants that are native to the region and climate in which you live is always a safe bet. These types of plants have existed in your climate for centuries and have adapted to handle virtually anything your local climate sends its way. Also, native plants almost always require less water, fertilizing, pest control, and other supplemental care. Looking for landscapers in the Ascension Parish area? Give us a call today — 225-303-3782. We strive to be a full-service landscaping company, offering landscape design, installs, maintenance, as well as other lawn care service.